"Sometimes the place we're used to is not the place you belong. You belong where you believe you belong. Where is that for you?" Disney has released the first official trailer for Mira Nair's new film Queen of Katwe, starring Lupita Nyong'o as Harriet Mutesi, mother of a young girl who from Uganda who trains to be an international chess champion. Now the title makes more sense. The cast features David Oyelowo, Ntare Guma Mbaho Mwine, Madina Nalwanga, Peter Odeke. This trailer presents the film as an inspiring, uplifting story of determination and intelligence and it will make you feel good, pop song and all. 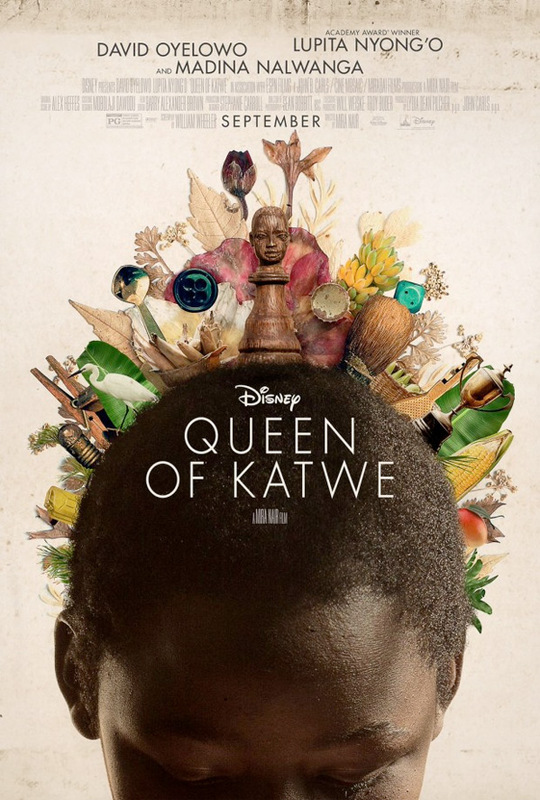 "Queen of Katwe" is the colorful true story of a young girl selling corn on the streets of rural Uganda whose world rapidly changes when she is introduced to the game of chess, and, as a result of the support she receives from her family and community, is instilled with the confidence and determination she needs to pursue her dream of becoming an international chess champion. Queen of Katwe is directed by Indian filmmaker Mira Nair, of My Own Country, Monsoon Wedding, Vanity Fair, The Namesake, Amelia previously. previously. The screenplay is by William Wheeler, adapted from Tim Crothers book of the same name. Disney Pictures will release Queen of Katwe in theaters starting September 23rd later this year. My son might like this. Actually Lupita Nyong'o is the mother of the girl who becomes the chess champion. You guys have the description wrong. Slightly paint-by-numbers, but I love the original story, so looking forward to this. Also, what a stunning poster! Really cool design work. Just to echo @camaglo:disqus - there's an error in your description. The "young girl from Uganda..." is Phiona Mutesi played by Madina Nalwanga. Lupita's character, Harriet, is her mother.